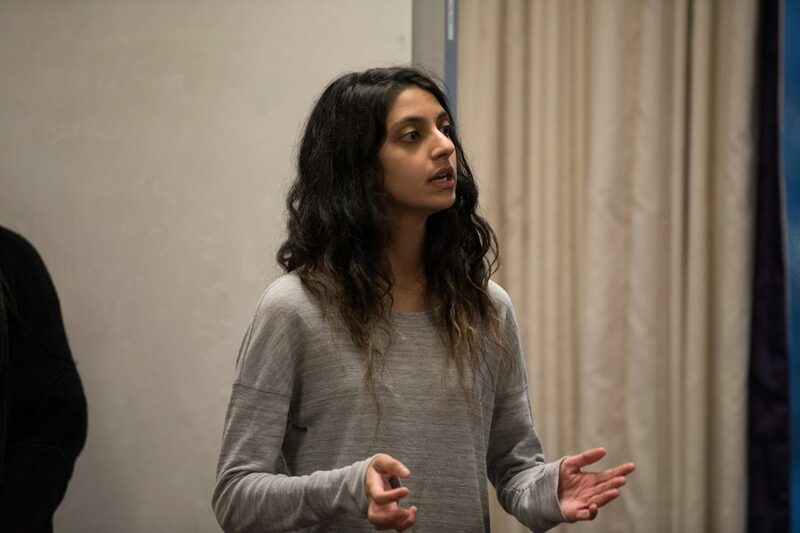 ASG president Nehaarika Mulukutla speaks during an ASG Senate meeting. Mulukutla presented reforms to ASG’s funding process for student groups, which were unanimously passed by Senate. Associated Student Government Senate unanimously voted to pass a finance committee code change Wednesday that will overhaul the way student groups are funded. The code change, which was presented by ASG president Nehaarika Mulukutla, will eliminate A- and B-status funding designations. Instead, there will be a five-tiered system in which groups apply for funding by event. The changes will go into effect in Spring Quarter 2019. Under the current system, student organizations are assigned to either A- or B-status and given funding for events based on that distinction. Mulukutla, a Weinberg senior, said the new system will be more equitable and allow for mobility and growth. Vice president for B-status finances Shreyas Tallamraju said the reform will allow B-status clubs specifically to expand their events. Under the new system, Mulukutla said there will be a singular finance committee that clubs will apply to for each event. The new vice president for finances will place each event request in a tier, ranging from Tier 1, which funds events that cost $10,000 or more, to Tier 5, for events that are under $500. Tier placement will be based on how much funding an event has typically received or, if it’s a new event, what students anticipate the costs will be. From there, events can grow through a “progressive percentage increase” in which less costly tiers allow for larger funding increases from year to year, Mulukutla said. The previous maximum yearly increase was 3 percent, she said. Events will also be able to easily move tiers, Mulukutla said, because they can grow organically through percentage increases in funding. At the April 4 Senate, Mulukutla said the new system was necessary because the current structure is flawed. “The system that stands is inherently unequal and complex,” she said. In addition, Mulukutla said ASG will create an Innovation Fund — a separate pool that exists to potentially fund new events or recurring events in need of a funding increase. Vice president for A-status finances Isabel Dobbel said under the previous system, 95 percent of the approximately $1.5 million collected by the Student Activities Resources Committee went to A-status groups, while the majority of student organizations had to split the other 5 percent. Dobbel, a SESP sophomore, said though large events can still get increases sizable enough to grow, small events will be able to grow more quickly than in the past. Dobbel said financial reform has been a goal of the past six administrations. Senate also elected McCormick sophomore Pedro Orellana to the Wild Ideas committee. Adam Downing and Henry Molnar were sworn in as speaker of the Senate and parliamentarian, respectively.